I just came back from our annual snow weekend at Uncle Ronnie and Aunt Cheryl’s house in Vermont where we celebrated my Dad, Uncle Ronnie, and Uncle Billy’s birthdays. It is always a great time skiing, snowboarding, eating, and catching up with family. This was the first time my Dad went skiing after his knee replacement surgery in October. Nervous at first, but that wore off quickly because he skied all over the mountain including diamond trails. Aunt Cheryl was with her sister in Mexico and the weekend wasn’t the same without her. This year Baby was old enough to go to snow school and take snowboarding lessons. My mom insists on their hair always looking perfect before leaving the house (even if it will be under a helmut snowboarding). Because she was taking snowboarding lessons, Princess also wanted to take snowboarding lessons in snow school. This was a surprise because she has been skiing for the last two years. Grouchy Husband is so excited at the thought of being a family of snowboarders. After everyone gets ready in the morning, we all walk down the driveway to the bus stop and wait for the bus to come take us to the mountain. While we wait, we take photos. The girls were signed up for snow school to learn to snowboard. Killington is one of the only mountains in the Northeast that offers snowboarding lessons to 3-yr olds. The girls go to snow school so that their whole ski/snowboard experience will be fun. At school, they play games, eat snacks, do crafts, go out for lessons with other kids, watch movies. The alternative would be to take an hour group lesson and then spend the rest of the day with Grouchy Husband and me trying to teach them how to snowboard. That would be miserable and they would never do it again. I always find out the ski school itinerary so that I can peak in on their lessons. Baby was the only one in the snowboarding lesson. The instructor walked with her out to the learning area. Helped her get into her snowboard. Pulled her by a string up the hill. Gave her a little pep talk. Then had her slide down. Then did this over and over again. It was adorable. Princess also was the only one in her snowboarding lesson. She was much more polished. She was learning to ride her toe and heel side. She even looked like a pro taking her boot out of the binding and pushing her way to the magic carpet. After a day on the mountain, it is so nice to come back to the house, relax and eat. The girls learned to play Heads Up on the iPhone. They got makeup lessons from Cousin Sami. When the girls are old enough to wear makeup, Sami will teach them (and me) how to put it on. Baby got life lessons from my brother. She also learned how to play dominos from Uncle Ronnie. And we celebrated another birthday year. I didn’t get to see this celebration because I fell asleep putting the girls asleep. I’ll have to remember to set an alarm to wake up in time next year. Happy Birthday Dad, Uncle Ronnie, and Uncle Billy! On our last day in France, we spent the day skiing, spa-ing, shopping, and eating in Megeve, a mountain an hour away from Chamonix. We spent the day in Megeve on the mountain, skiing, spa-ing, shopping, and eating. To get to Megeve from Chamonix you go down a windy mountain road, then up a windy mountain road. It was too much for Baby’s stomach so we had to make an unexpected stop in the middle of the trip to clean up throw up. It put a damper on the trip and morning but thankfully after a pleasant breakfast and an amazing massage from a masseuse that trained in Thailand, the drive was a very far far memory. The highlight of this day and probably the whole trip was being hosted by the Rothschild’s for lunch at l’Ideal, a restaurant at the top of the mountain you can only get to by gondola. My brother does a lot of wine business with the Rothschild’s and they own the resort in Megeve. I love their wine and drank a LOT of it. Everything about this lunch was perfect and amazing. The weather, picture-perfect view, delicious food, spending time with family…perfect. Cousin Sami and Michael with Princess. Cousins Michael and Sami, and Sami’s husband, Mike. Aunt Cheryl and Uncle Ronnie. My girls getting their hats ready for the picture. Because it was such a sunny day, the restaurant provides complimentary hats. Uncle Ronnie (my Dad’s best friend), my Dad, and Uncle Billy (my dad’s brother born exactly one year after him). My aunt, uncle, and cousins. Cousin Karyn and my sister. Karyn was wearing her favorite t-shirt. My sister was being silly. Uncle Ronnie! When I was little, my Dad was away on business and Uncle Ronnie stayed with me in the hospital because my mom had to take care of my brother and sister. I was scared when they wanted to give me a shot so he let them give him the shot first. It was a long French lunch, over three hours. The girls struggled through it like champions. I had the wood-fire grilled veal chop. Even the kids meals were delicious. The most memorable food at lunch was the profiterole. Because my birthday was only a few days later, we celebrated at lunch. They sent out a bottle of great champagne, they know exactly how to get to a girl’s heart. I had taken the Princess to the bathroom so I missed the whole thing but have this picture to remember. I look at this picture and feel so blessed to have shared this amazing experience with all of these people and the mountains. We just came back from an amazing ski vacation in Chamonix France. This was a vacation of celebrations, my Dad and Uncle Ronnie’s 65th birthdays, Uncle Billy’s 64th birthday, cousin Karyn’s birthday, my birthday, meeting cousin Michael’s partner. The vacation had a rocky start, as we were about to get off the plane, Baby threw up what looked like a week’s worth of food all over her seat, her clothes, hair, everything. This was our unfortunate way of finding out she has motion sickness. After the hour drive from Geneva airport to Chamonix, thankfully, this memory was quickly forgotten when we got to town. We rented a two-bedroom apartment at the Le Majestic Congres. It was a beautiful, grand, old hotel that was converted into apartments. We booked through Chamonix All Year. Great company, great service. Nick, the owner, was very helpful when we had a mixup with the apartment address and Lianna pleasantly tended to all of my obnoxious American questions. After settling in, we walked into the center of town to find a place to eat. It was a beautiful day so wanted to eat outside. My first meal, classic French bistro, Moule Frites with a couple glasses of wine. The girls walked around town with their ice cream pops they got from our dinner. 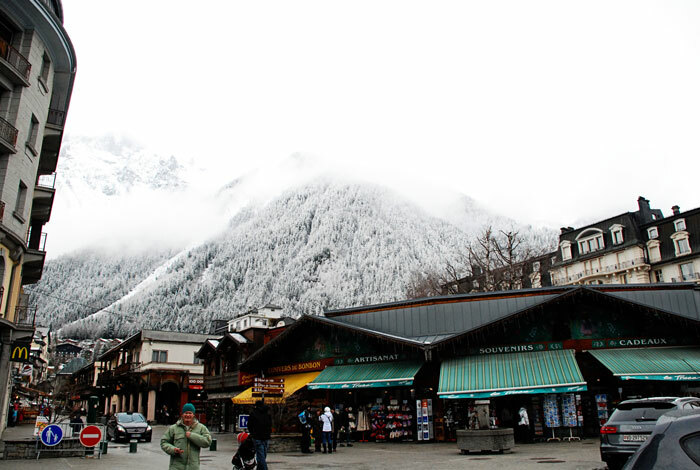 The town of Chamonix is fabulous. There are lots of restaurants, shops (even a Chanel), and when you look up, you are surrounded by these gorgeous snow capped mountains. The town is separated by a stream of water. The girls were convinced they would see fish in the water. Within the first hour into our flight, Princess had a fever. She is like a delicate flower, the excitement of the trip and the stress of packing her choice of four things took a toll on her body. We got a tip from the management company to shop at the SuperU in town for groceries. It was where all of the locals shopped. Before heading home for our first night in Chamonix, we stopped to pick up some groceries and ingredients to make chicken soup. The chicken soup I made was so tasty. I think it’s because of the quality and freshness of the chicken meat. We flew a day earlier then the rest of my family so we decided to do some site-seeing our first full day while we waited for everyone to arrive. We decided to take the train down to France’s largest glacier, Mer de Glace. As parents of a 2 and 5-year old, this was not a good activity choice because after the train ride, there was a short gondola, and then over 400 steps to the glacier. Baby wasn’t able to walk all these steps so she was on my Grouchy Husband’s shoulders. Princess was fine walking down, walking up was a totally different story. Did I mention it was a cold, rainy day and she was running a fever…she cried the entire over 400 steps up (I couldn’t blame her, I wanted to cry also and I didn’t have a fever). When we finally got back to the top, I let both girls pick out a lollipop from the gift shop and instantly the whole experience walking up the over 400 steps had disappeared. At the center of the glacier is a man-made ice castle. Every year, this castle has to be reformed because of the movement from the glacier. The girls had just seen Frozen so they were hoping to see Queen Elsa in the castle. After the long day to see the glacier, I just wanted to go home, dry off, relax, and cook dinner. 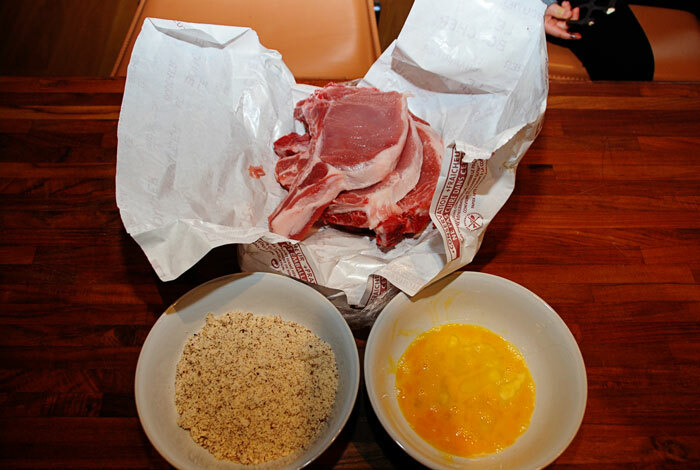 I bought pork chops from the SuperU and with the almond meal I brought from home made pan-fried pork chops. Look at how yellow the egg yolks are…amazing! A couple of things from our apartment that were a must-have when traveling with small children. (1) Washer/Drying Rack. As I mentioned, Baby threw up on the plane ride to Chamonix. She also threw up on the car ride to Megeve (more about this fun trip in my next blog post). I cannot begin to tell you how thankful I was to have a washer/drying rack. I even washed all of our clothes before leaving so I didn’t have to wash them when I got home. (2) Heated towel rack. I’ve already told my Grouchy Husband that we will be getting one in the next bathroom we renovate. I hung the hand towel to have a warm towel after washing your hands. I hung my bath towel so I would have a warm towel after I took a shower. I hung the floor towel so I would have a warm towel when I got out of the shower. I hung my face towel so I would have a warm towel to dry my face. Obsessed with the heated towel rack. Can you tell? Cousins! Cousin Karyn. My Jewish cousins, Sami and Michael. Sami’s husband, Mike. Michael’s partner, Sultan. Sami and Michael’s cousin David from Switzerland. Got it? My mom and the girls waiting for the horse and carriage man in town to come and take us for a ride. We waited an hour and he never showed up. Waiting for the bus. We took the bus to go to the different ski mountains. The bus rides were short and you could see a different mountain every day. The first day of skiing we went to Brevant. I decided not to sign Princess up for ski school like I usually do. I was worried about finding an english-speaking instructor and we were on vacation, so we weren’t planning on skiing the full day anyways. She did a great job and started to parallel her skis. This picture makes me look like a better snowboarder then I really am. I like that. Taking pictures outside the restaurant we had lunch. I had warm wine for the first time here and it was surprisingly good. I drank wine at lunch every day. It was glorious. Look at the mountains. What an amazing view! Our group of skiers and riders. About to break for a snack at the base lodge of Flegere. Behind the net fence there were chairs and tables to relax in the sun and enjoy a snack. It was a beautiful day. We ate french fries, drank beers and I had too much wine. Skiing after our snack was challenging. After snack, we decided to take the scenic route down the mountain and take lots of pictures. One of the highlights for my Dad is skiing with Princess. It makes him so happy. This was the view all day. Amazing. The mountains were enormous. I thought the West Coast had great ski mountains. They were no comparison to the Alps. This past weekend we went to visit my sister and her husband, Mike, in Boston. My whole family (parents, younger sister, brother) went to visit and it was kinda a big deal because my sister went to college in Boston, lived in Boston after college and grad school, and my parents never went to visit her. My family is from New York and we are very New York-centric. Shopping is better in New York, restaurants are better in New York, we have better culture, more airports, etc. When we travel, it’s usually to amazing ski mountains or to see a natural wonder, things that cannot be found in New York. I use to think like this also but since our Boston visit last year, I’ve come to really like the city. My Dad wanted to take a ferry ride so we went on the USS Constitution Cruise around Boston Harbor. It was a great 45-minute cruise identifying the landmarks around the harbor. It usually stops at the Charleston Navy Yard but it is closed right now because of the Federal government shut down. The view of the city and the sailboats was great even on a cloudy day. We walked to the cruise from my sister’s apartment and on the way back stopped at the Greenway Carousel in the Rose Kennedy Greenway Conservatory. This carousel doesn’t have any horses, instead it was made with animals you will find around Boston. Cod, the state fish of Massachusetts, can be found on the carousel, as well as a whale and peregrine falcon, a local bird. The animals were painted beautifully and my Baby was thrilled to ride the turtle. My Grouchy Husband and I get motion sickness on the carousel so my Mom always goes on them with the girls. After the carousel we stopped at Quincy Market. There were a lot of street performers that day so it reminded me of the South Street Seaport. In the afternoon my Princess baked an apple pie with my sister. She has loved to cook and bake since she was little. For dinner we went to the Brazilian steakhouse, Fogo de Chao. It was perfect for our big group. It’s buffet-style eating with a big salad bar in the middle of the restaurant and waitstaff bringing around all different types of meat. Each person receives a round paper circle. If you had the green side up you want the waitstaff to come to you with their selection of meat, if you had red side up you don’t. I tried every cut of beef, pork ribs, parmesan crusted pork, different cuts of lamb, chicken drumsticks, and sausage. My favorites were the prime rib and lamb chops. Everything was delicious. We celebrated my sister’s birthday at the restaurant. Her birthday was in September right after she got married. That was a really busy time so she decided to celebrate her birthday with us in October. The next day we were all leaving to go home so we took it easy and went to a playground in the Boston Common and then out to lunch. My sister lives on the Boston Common so it is super convenient to go into the park and play. My Princess loves the monkey bars. It is how she defines a good playground. Mike was amazed at how well she does them. He decided to try them also. My Princess was amazed how well he did the monkey bars. We actually all were. After the playground we walked through the Public Garden. There is a statue of George Washington on a horse. It was a beautiful day for a walk. Here we are walking and talking through Commonwealth Avenue Mall. Then we walked past the finish line for the Boston Marathon. The night before I took this picture of the prayer ribbons that were tied to the fence of the Arlington Street Church, just down the street from where the marathon bombing occurred. We finally reached the restaurant! My brother wanted fried seafood so my sister brought us to B&G Oysters. Here is a picture of the ladies at the table. I even got a shot of my Grouchy Husband and I. It took a little while for the food to come so thank goodness there were toothpicks the girls could play with. Taking a toothpick out of its wrapper can be better then playing with toys. The appetizers were amazing. Fried calamari, fried oysters, fried clams, and steamed muscles. Yum..meee. I ordered the lobster roll on a bed of lettuce. There was so much lobster and it didn’t have a lot of mayonnaise. It was perfect, one of the best lobster rolls I’ve ever had. A bloody mary would have made this meal perfect but they only serve wine and beer. But they serve fresh cut fries and that almost made up for it. We were in Boston for less then 48 hours and after writing this blog post I can’t believe we did so much. It was a great trip. Everyone in my family (amazingly) had a great time. One thing that could have ruined the trip but thankfully did not was on the first night my sister took my parents and younger sister out to dinner at an Italian restaurant. On the way down, the elevator got stuck and it took 25 minutes to get everyone out. My mom has really bad anxiety and it was really warm inside the elevator. She said in another 10 minutes she would have passed out. Thankfully that did not happen! My parents would never come back to Boston if it did. I’ve come to realize that what makes a great experience is not where you go or what you do, it’s the company you are with. I have a crazy family and when we are together we have the best time.